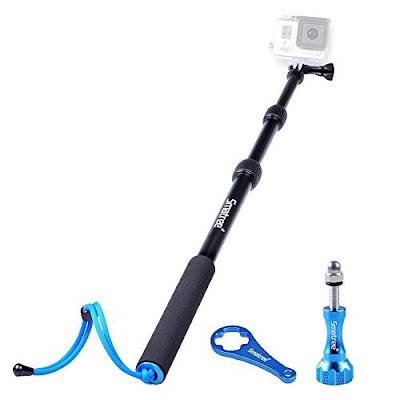 Selfie Sticks have become a rage among youngsters and outdoor enthusiasts. The experience of filming yourself while you are indulging in an outdoor activity, adventure sport or an underwater sport can be quite thrilling. These simple gadgets are a must if you own a GoPro camera. 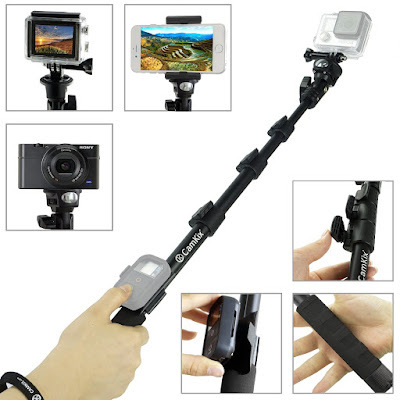 Simply attach the camera to the selfie stick and begin filming. Also, these sticks don't cost a bomb. You can get get a decent one for under $30. The following sections constitute a brief review of ten best selfie sticks in 2016. 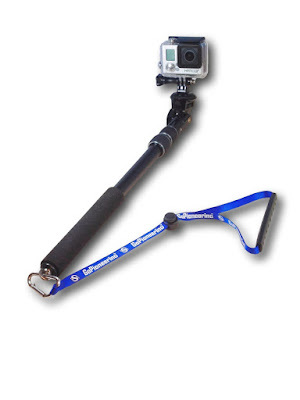 GoPioneering is a rugged selfie stick created from strong materials to withstand heavy duty. 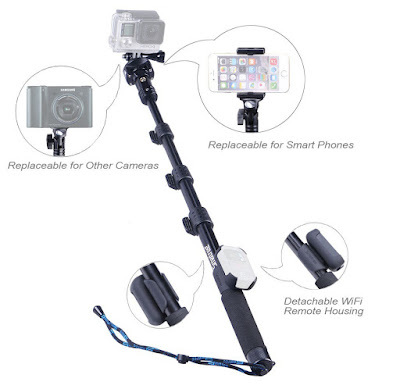 You may attach an iPhone, GoPro Camera or a DSLR monopod to it and start filming. It is also perfect for people who like to shoot underwater while diving. The heavy duty wrist strap prevents accidental drops and slips while shooting at extreme angles. This handheld monopod pole arrives with 7 extendable sections which enable it to extend for up to 43 inches and retract to 8.25 inches. It is compatible with almost every GoPro camera. This product also includes a small tripod for mounting digital cameras. The rubber handle provides ample gripping when you're on the move. You also get a HeroFiber cleaning cloth to keep the selfie stick dust free. With a two-stage telescopic body, the GPE-10 can be extended from 14 to 24 inches quite easily. Once you tighten the extension lock, the stick becomes completely waterproof. 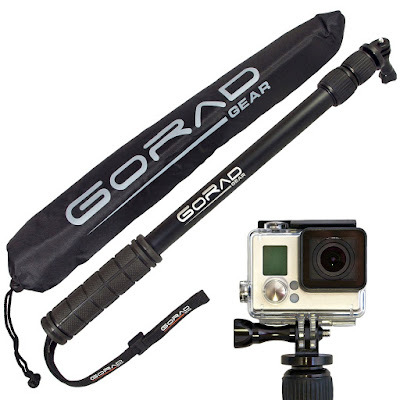 You may mount GoPro cameras on this stick directly without needing any adapter. The wrist strap helps you protect your cameras in case the stick slips from your hand. The WiFi remote clips allows you to control the camera wirelessly. At 4.83 oz, this stick is pretty compact and lightweight. You may retract it up to 12.2 inches and extend it till 40.5 inches using a twist-and-lock mechanism. The pole looks strong enough to keep your camera secure. Along with the Luxebell pole, you also get an adjustable phone holder. 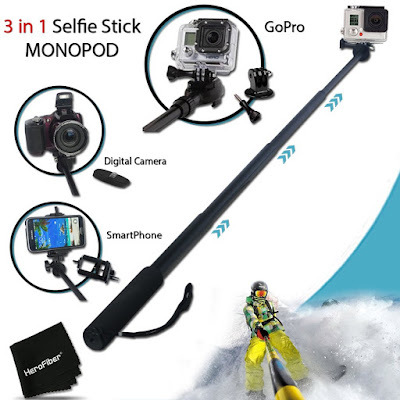 This selfie stick is ideal to use with GoPro and a wide range of smartphones including the Galaxy S6, S5, S4, S3, HTC One, Nexus and all the iPhone models above iPhone 4S. The telescopic pole allows a quick length adjustment between 17.5 and 48.5 inches. The adjustable ball-head spiral lock lets you get multiple shooting angles with 180 degrees and 360 degrees in vertical and horizontal directions, respectively. The WiFi remote is conveniently housed on the pole in such a way that you can switch off and switch on the filming with your thumb. 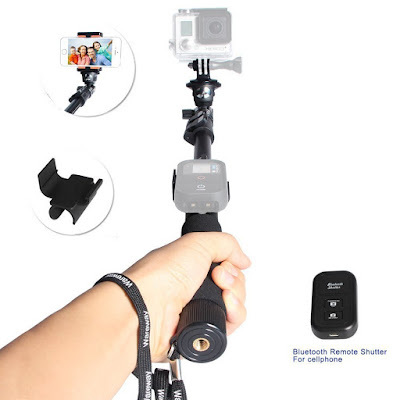 This is a high quality selfie stick with high extension capability - it extends between 16 to 47 inches. CamKix created the pole with the sturdy materials so that your camera remains safe even when the pole is extended to 47 inches. A removable cradle is provided for easy WiFi remote attachment. The clip-and-lock system makes the task of adjusting the pole length quite easy. All you need to do is open the clips, adjust the rod's length and then close the clips. The pole is strong enough to keep your camera secure and steady even during action sports. 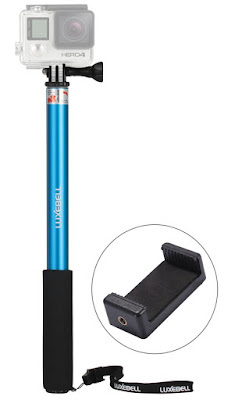 This telescopic selfie extension stick made from aluminium comes with a rubberized grip and an adjustable wrist strap. It can be telescoped to any length from 17 inches to 40 inches. Weighing just 9 ounces, it can be carried around easily for filming your outdoor adventures while skiing, surfing, traveling and diving. The manufacturer offers a lifetime guarantee on this product along with a hassle free return policy. 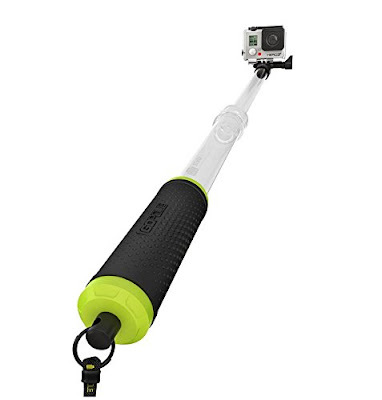 This selfies stick supports a wide range of smartphones in addition to GoPro cameras. The camera holder may be rotated for up to 180 degrees for the perfect angle to take a shot. The pole's handle is made from non-slip foam to prevent the device from slipping off your hands. The Wareway wrist strap can be attached to your hand to protect your smartphone or camera. The SmaPole S1 is made of aluminum alloy, and so, it is light, strong and durable. Its length can be adjusted quickly from 18.5 inches to 40.5 inches for a great shooting experience. Smatree offers a lifetime warranty on this selfie stick. Along with this product, you get a blue rope, a plastic screw, and an aluminium screw. Also, at 6.7 ounces, it is easy to carry around with you. 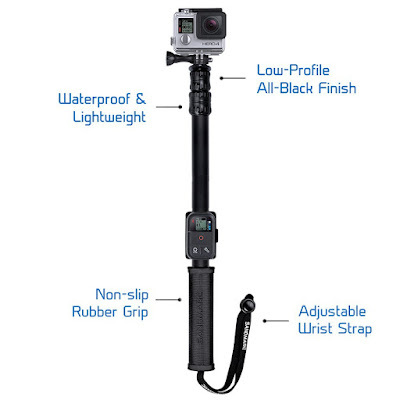 In addition to an aluminum tripod mount, this extension pole has a GoPro compatible tripod mount to connect GoPro Hero 4, 3, 3+, 2 and 1 cameras to the pole. The twist locking mechanism of the telescopic pole allows it to be adjusted to any length between 17 and 40 inches. Since the stick is made from waterproof materials, you may use it underwater for activities like scuba diving or snorkeling. This product comes with a Nylon bag and a lifetime guarantee against any manufacturer defects. We hope this information helps you buy the best GoPro accessories for your GoPro 3 or GoPro Hero 4 camera.